One of the great universal mysteries of parenting: why we think our kids are extra cute in sunglasses. But let's not question it, let's just go with it. I've been wanting to do this post for awhile but I'd thought Pete wanted to do it. He does, but he hasn't been able to get around to it, so I now have his blessing to go forward. While watching golfball with her Dad some weeks ago, Daphne suddenly became very interested (she calls it golfball...you know, football, basketball, baseball, golfball). Now they love going to the driving range together! I suspect Pete might be slightly pleased about this little development. She's learning the names of the clubs, parts of the course, rules of the game, etc. Tiger wears a red shirt, that sort of thing. We got a sweet coupon in the mail for a local golf course a few weeks ago and made a family outing of it. As per usual, my role in these sort of outings is primarily to make sure James does not incur a fatal injury. So maybe not as fun from my perspective but I'll take it. I know this will be a great memory. This past week the kids and I made our first trip to the zoo since James became a "walking baby." When I was going back through these pictures I was reminded of the first time we went to the zoo with Daphne once she had learned to walk. 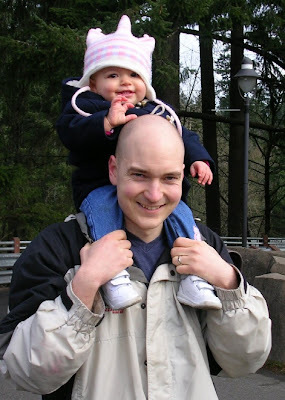 It was my birthday 2007, and Pete had surprised me by taking the day off work and planning a family outing to the zoo. So I went back and found this video of that day. What you'll see below is a classic example of child #1 vs. child #2 parenting. Although Daphne was a couple months younger than James is now, she was a more "seasoned" walker than James. Yet, I was just compelled to hang on to that hood of hers to make sure she wouldn't fall. Embarrassing. A couple of Saturdays ago Pete was working so I took the kids down to Salem for the annual "Ag Fest" at the state fairgrounds (I told Daphne it was Farm Day...she tends to associate festivals with rides, unfortunately). My mom met us there and we all had a grand (read: exhausting) time. There was so much to do and we barely scratched the surface. Kids under 12 were free and nearly everything inside was free once you got in. They even had a big farm breakfast that was free for kids 3 and under. I think we'll try to go next year too if anyone would like to join us! And for the record, we didn't see any pigs. Thought you might be curious. Soccertots is a program at our local indoor soccer center for small children. The kids and I went with my MOPS (Mothers of Preschoolers) group from church. I don't really have much to say about it, so I'll just break it down into percentages to give you an idea. Still, Daphne actually shows a bit of aptitude for the soccer part and can dribble pretty well. But even if she's bad, I'm fairly certain there will be soccer in her future. Hard to imagine childhood without that image of a tight swarm of little kids in too-big uniforms all trying to kick the ball at the same time.